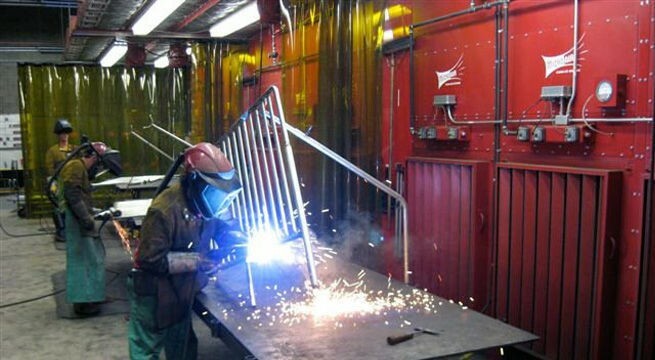 Micro Air CAB's (Clean Air Booth) draw weld smoke and fumes away from the work area, returning clean, safe air to the work zone in a northeast playground equipment manufacturing facility. 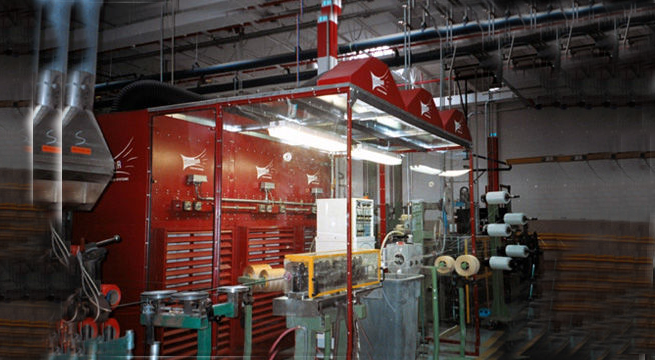 Triple module CAB system with regain air and lexan booth panels captures powdered dust from wire drawing operation. MICRO AIR CAB with regain captures composites dust and particulate in grinding operation. 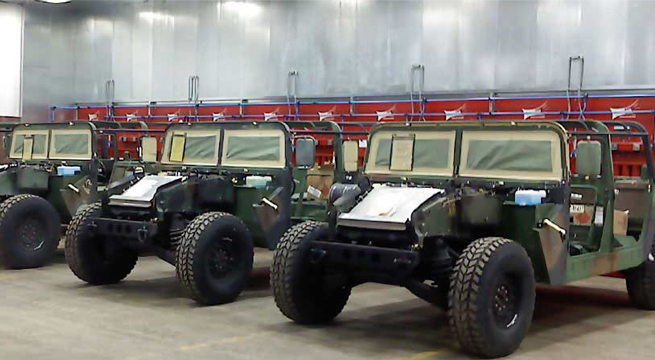 Twelve module CAB system captures sanding and grinding dust at military vehicle refurbish facility. 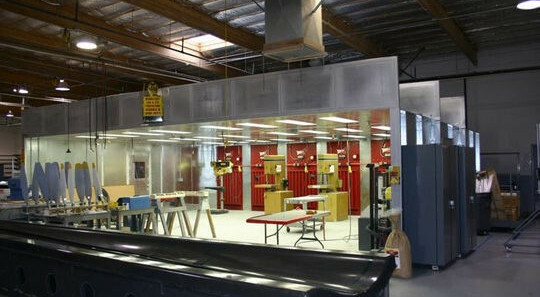 The Micro Air® Clean Air Booth (CAB) is a unique blend of simple modular construction and leading edge air cleaning technology. 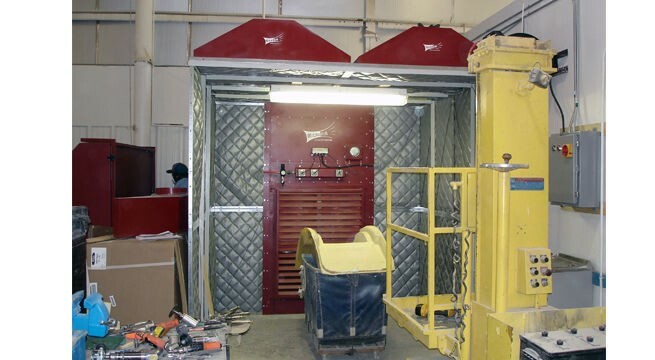 It's a self-contained, ductless system that provides maximum manufacturing flexibility while protecting workers from the airborne hazards associated with applications such as cutting, welding, grinding, sanding, finishing, and multiple other industrial operations that produce airborne contaminants. Worker efficiencies also improve with unrestricted range of movement, improved vision and breathing zones. Micro Air's® modular design allows you to customize your booth to your specifications. Walls and ceiling construction are made from 2' x 4' galvanized panels providing maximum design flexibility for width, depth and height requirements. You can construct custom booths to meet your application requirements or order pre-packaged kits, complete with support structure. Micro Air® self-contained, ductless Clean Air Booth maximizes manufacturing flexibility while protecting workers from the airborne contaminants generated in industrial operations such as welding, grinding, sanding, finishing, etc.Options for built-in regain air systems optimizes cleaning by increasing airflow velocities, bringing air from the back of the booth to the front, and returning it to the inlet grille, effectively washing the workers breathing and vision zones. Improved work environment - no need to delay pulse cleaning until the workers have left the booth. Online Cleaning with no "Banging" associated with reverse pulse cleaning systems. Increases airflow velocities - washes the workers breathing and vision zones. Roto-Pulse cleaning cleans the full cartridge versus only 60 - 70% with typical cleaning systems thus extending filter life and lowering maintenance costs. 5 Year Warranty on Roto-Pulse Cleaning System. Air exhausted out the top of the power module returns clean conditioned air into the facility, eliminating heat/cool loss and the need for make up air units. 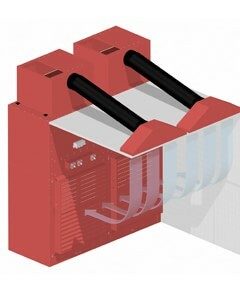 Exhaust options include silencers, regain air supply systems, HEPA after filter modules for maximum filtration. When sparks are present, the baffle inlet diverts the large particles greatly reducing the risk of fire. Filters can be selected to match your application requirements.